Bitwig has announced the upcoming Bitwig Studio 3, a new major upgrade to cross-platform music production software. Version 3 will open a new window for working with sound with “The Grid”. As was hinted at from the start, Bitwig Studio was always intended to provide a fully-modular sound design option, and this has become reality with The Grid. The Grid is an open modular environment built in to three new devices: Poly Grid, Mono Grid and FX Grid. While all Grid devices work in the same way, each allows for different configurations. Want to build a polyphonic synth? Start with Poly Grid. Need an adaptive audio effect with your signature sound? FX Grid will chew up incoming audio, either gently or otherwise. In the mood for cascading drones? Mono Grid is a great workbench for you. And when your idea morphs, just take what you’ve made and move to a different device. 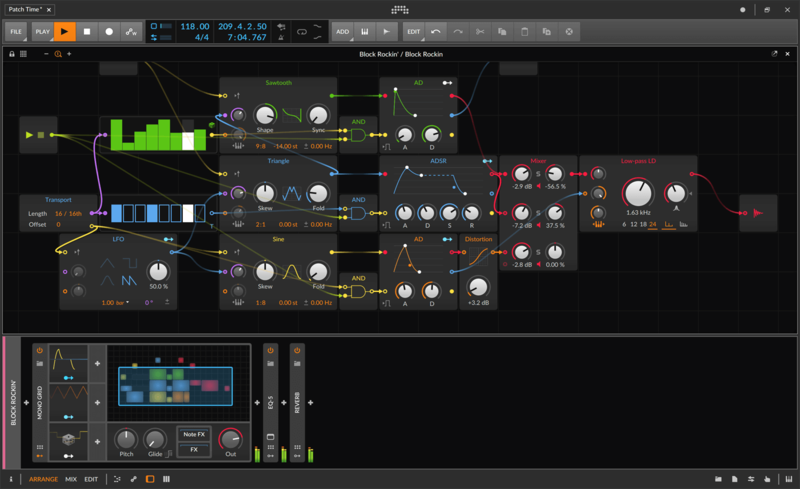 Sporting a bevy of Grid modules and a supersonic patching workflow, The Grid is a truly modern modular patching environment that lives within its family of new devices. Ideal for designing sounds and harnessing synthesis. Grid devices can be nested or layered along with other devices and plug-ins, and they are controllable via MIDI mapping and from the Open Controller API. Song position is available as a sample-accurate signal, locking a patch in The Grid to the project’s timeline. Arranger or clip-based automation can be added for any parameter in grid patches, even in combination with Bitwig Studio’s existing modulators. Grid modules like envelopes, LFOs, and sequencers all have modulator outputs as well. And just as Bitwig Studio’s modulators can control any parameter in The Grid, any grid signal can be used to modulate child devices. With dedicated grid modules for sending any control, trigger, or pitch signal as CV Out and receiving any CV In, hardware can be seamlessly integrated with The Grid. In The Grid, all signals are created equal and 4x-oversampled for the highest sound quality. All signals are interchangeable so any out port can be connected to any in port. Every signal is stereo. That includes control signals, which indirectly affect audio. And plenty of modules can Stereo-ize signals, adding variety where needed. With The Grid’s quick workflow gestures, new modules can be dropped directly onto ports, automatically wiring them into your patch. And for signals that are needed regularly, there is the option of pre-cords. These clickable icons appear beside in ports, allowing common connections to be made wirelessly. After pitch, timbre, and loudness, phase is the essential element of sound, capable of driving basic time functions, complex modulation synthesis, and so much more. With a dedicated category of phase modules, Bitwig has made these concepts freshly accessible and newly relevant for modern music production. Bitwig Studio 3 will be previewed at NAMM and it is expected to release in Q2 2019.